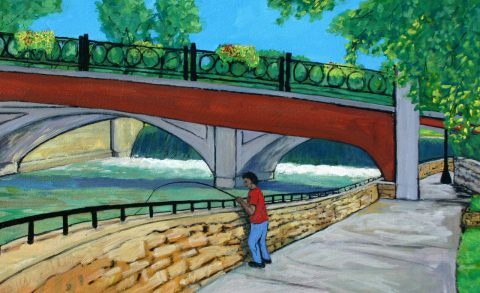 I create many different kinds of art, from serious paintings to playful wooden crank toys, but the kind of painting I enjoy most is plein air – painting in the great out of doors. I like it because it gives me a great excuse to be in beautiful places, and observe them closely. It’s amazing what wildlife, plants and insects (Poison Ivy? Watch your feet for ants! ), and subtle changes in weather and mood you can experience if you’re just quiet and there and looking. I used to be a fly fisherman and that involved some of the same elements. 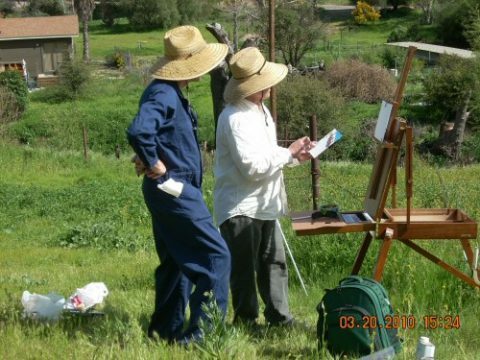 In fact, plein air painting is a lot like fishing! You never know what you’re going to come home with when you head out for the day. Maybe a lunker, maybe you get skunked. And it doesn’t take a lot of fancy equipment. Mostly you just have to pick your spot and concentrate on making it work for you. 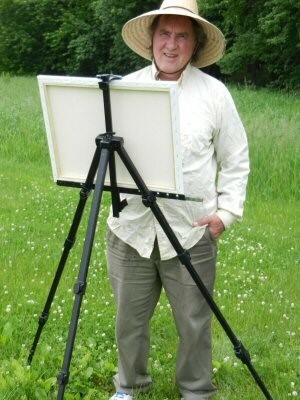 I do have few special tools I like to have handy when I paint outdoors – besides the bug spray. You need to work fast – the sun is always moving and the shadows change and the day will end. So, I use a portable easel that sets up quickly (some people prefer the “French easel” but those don’t work well with large canvases – they blow over). Also, I like to get my drafting done quickly. 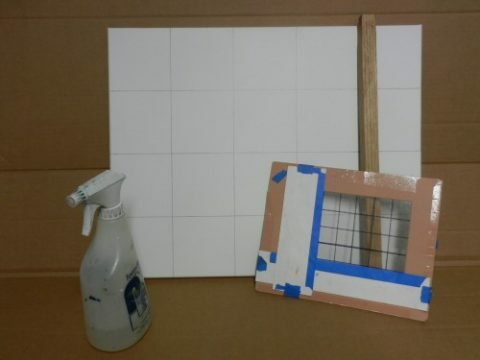 I put a grid on my canvas, and then use a matted, gridded clear plastic to hold up to the scene I chose. Then, with the scene framed, you transfer the main shapes to the grid on the canvas (using pencil or – pick your color – black, blue, yellow, red; doesn’t matter because you will cover it up along with the grid lines). I also keep a straight edge handy for straight lines if I’m painting buildings (just hold it near the canvas and run the brush along its side). One other very useful tool if you paint with acrylics is a spray bottle filled with water. You can wash your brushes on the spot, and if the paint is drying too fast, you just spray down the entire painting. I’ve painted in the desert a lot and on a hot day there, the paint almost dries on the brush as you try to get it to the canvas. Sprayed my own head to cool off once or twice, too. Speaking of the painter’s comfort, I usually wear boots (especially in the desert – lots of bitey and pokey things there) and a long-sleeved white shirt for sun protection. A large-brimmed straw hat is nice too, but it makes you look like everyone’s image of Van Gogh which is a bit of a kick-me sign. Someone is sure to stop and offer you advice about what is missing/needed/not right in the painting! I haven’t mentioned yet how I choose my scenes, or compose a painting. But that’s the easy part. Once you’ve found a place worth painting, subjects worth painting will be all over. When I first moved to Northfield a few years ago, I looked around for a few weeks, both in town and in the countryside, for places to paint. 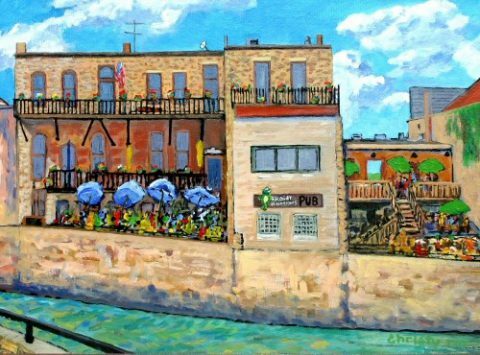 I quickly settled on the Riverwalk area, because there was something worth painting in every direction. The were trees for shade so I didn’t have to paint in the sun. I was out of the way of traffic (country roads in Minnesota can be dusty and hazardous). There were old buildings and rocky textures and water and people. Everything a painter might want in a scene. One last thing about outdoor painting. Just like fishing, it can be more fun if you go out with friends. You can get instant feedback, see how they approach a subject, and steal their ideas. Maybe there’s a little playful competition? And it gives you a little extra stick-to-it when the bugs or the wind or silence just make you want to give up and go home. Hang in there and now that you’re here just start a painting – you never know what you might catch.